These trees are usually small with special features like interesting bark, showy flowers, or eye-catching foliage. An ornamental also has a pleasing shape and fits easily into modern yards. 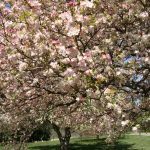 This may seem like a tall order of outstanding characteristics, but the “ornamental” part of the description means that the trees are selected and bred to deliver in a big way. The main feature, however, is that the size is smaller than majestic shade trees. Because of the more compact dimensions, a greater number of this type may be included in a suburban landscaping plan. The shorter heights may not interfere as much with overhead lines. (Though it is still wise to give utility lines a wide berth from your trees). 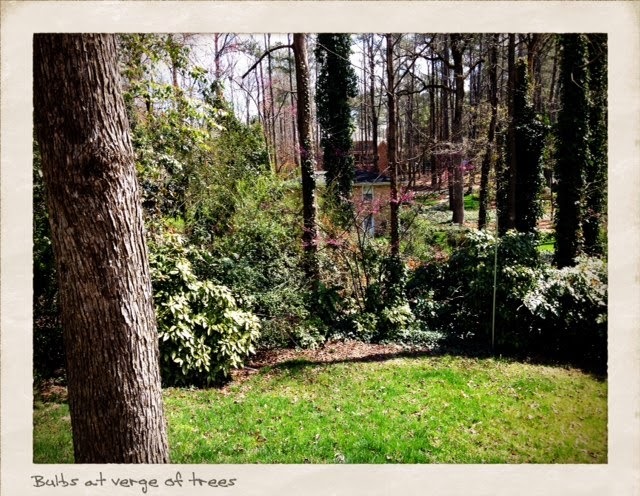 Read more about Positioning Trees in Your Yard on Ilona’s Garden website. (1) Even though more trees can be planted, avoid a “spotty” look. One of the key rules of good design is to repeat elements in a cohesive way. With ornamental trees, choose to have groups of the same choice, or use the primary cultivar in several spaces within the landscape plan. Dotting a different tree into each possible spot create a disjointed effect that lacks harmony. It is a common mistake made with perennials. The same rule applies to trees, perhaps more so. I edge very close to disregarding this design principle at times. Something of a “collector” there is a wide selection of many desirable trees in the ornamental class. But the rule is to use a number of one plant, the effect being so much more pleasing. (2) Choose specimens that do well in your climate zone and planting conditions. Nothing undermines the good looks of your landscaping than unhealthy trees. Or worse: dead ones! 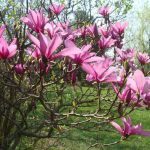 Buy from a reputable local nursery for best results or do your research to discover which of the ornamental trees thrive best on your property. Drainage is very important. Good or poor drainage, and whether the tree tolerates the moisture levels of the soil. Insect and Disease problems likely in your area. Some trees are resistant to problems and some much more susceptible. This is one of my favorite tips for successful landscaping of all types. 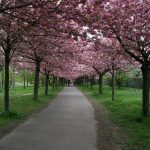 Visit a local arboretum. In my own area of Ohio we have two that I love, Chadwick and Dawes Arboretum. No book can match the real world lessons of how a plant may look at maturity in the yard. While trips to parks and neighborhoods are great places to pick up ideas on trees to plant, the Arboretums will provide the names and placement inspiration. Taking notes can be as simple as snapping photos of favorites and their plant labels. With these tips, once the trees are in place, bring bulbs and groundcovers to the base of the trees to accentuate the beauty of the season they are most attractive. Many will “play nice” with perennials and other plantings to create lovely pictures in a chosen season. 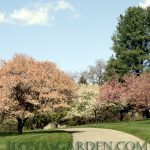 Dogwoods with spring flowering bulbs and Virginia bluebells is a scintillating spring example. Think of your own, and make pictures that bring special beauty to your property. Are You Ready To Plant? 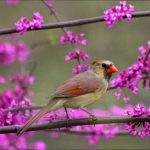 With these 3 tips to guide your landscape plan, choose some ornamental trees which match your situation and conditions. Fall is an ideal time to plant trees. For most species it is better than the spring. 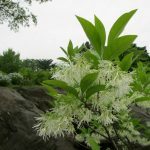 Put together a plan that includes those chosen for fragrance (Crabapples, Witch hazels), winter interest (Contorted Hazel, Stewartia Pseudocamellia), or autumn color (Acer palmatum spp, Fringe trees). 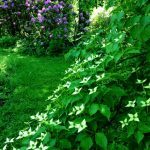 These are only a few of myriad choices available, and if you match the choice to the property (tip #2) this may well be your favorite part of the garden landscape. South, as in the state of Georgia, and so you won’t hear me complaining about the interminable reappearance of cold in Ohio. Staying with my son who has a nice property right within Atlanta, he is like many young professionals, who just doesn’t feel the desire for lots of yardwork. Yet, he likes the idea of a nice looking yard. So he talked with me about bulbs. I had him help a lot with our yard when he grew up, but he seemed to miss the notation on when we plant bulbs- or thought the rules changed when crossing the Mason-Dixon. Rule # 1 for spring blooming bulbs: they are planted in the fall because they need a cold period to bloom. We see them now in their glory in Spring, but we had to take a bit of forethought to buy those unprepossessing bulbs and put them in the ground last October or so. Taking notes on which flowers you like, what the bulb varieties and names are, where the best places to put them are all things we can do in the springtime, but the actual planting has to take place in the autumn. 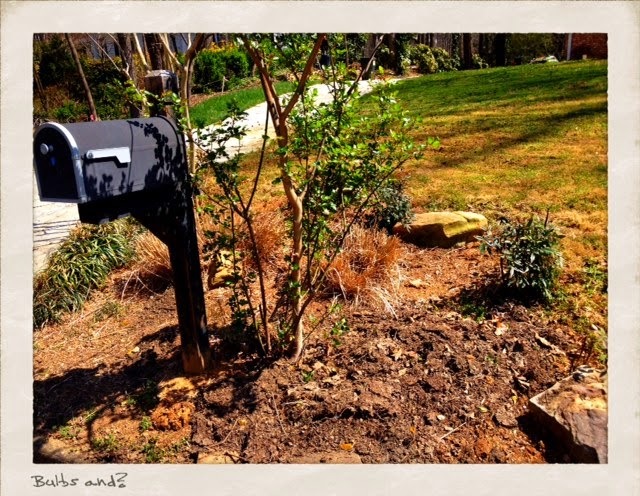 However, there are some things that change when gardening in the South from my practices in the North, and I was wondering what bulbs do best in Atlanta’s gardens. I will be doing some research, but if any readers from these warmer climes have suggestions I’d love to have them. Bulbs are ideal for “no gardening” people who own houses. 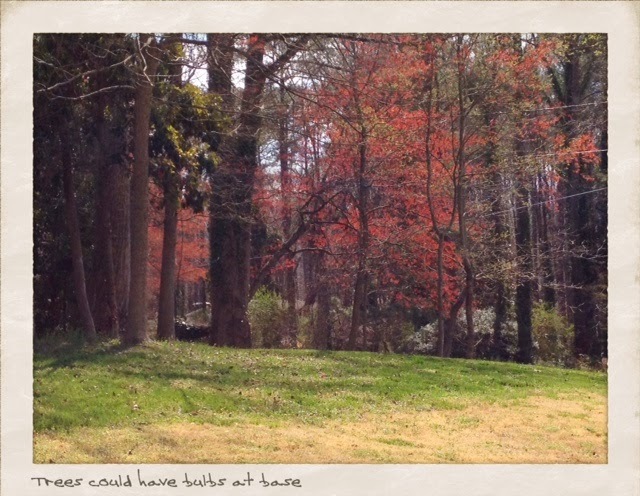 The only caveat is to allow their foliage to age and wither, so they need to be in spaces that don’t require mowing to keep the neighbors happy. For my son, that means the area around the mailbox, the space between the walk and the house and the wooded verge beside the creek. I could visualize Glory of the Snow, Daffodils, Scillas, and some specie Tulips. During summer a simple stand of annuals, or daylilies with geraniums would provide an attractive flowering cover for this bed that already has some ornamental grass ( I just cut it down for the new season), liriope, hostas, and small shrubs. A few hours work in spring and occasional maintenance that even a mulched area requires is all that is needed. Can’t you picture some cheery spring bulbs when looking into this photo? But then, I’m the one that loves plants and gardening and becomes excited at the idea of what a property with trees and a small stream could look like with some wildflowers, irises (oooo- Iris ensata! )….